Sheila Viswanathan is a nutrition professional with three years of experience teaching individuals of all ages about healthy eating and general nutrition. In addition to holding a doctoral degree in nutrition and public health from Columbia University, Viswanathan is also a registered dietitian. She has written for various online publications, as well as scientific journals since 2005. Granola bars are gaining popularity as a healthy, on-the-go snack. You can purchase them at most supermarkets in boxes of 6 to 12 bars. Nature Valley, part of the General Mills family of products, has a range of granola bars from which to choose. Below is some nutrition information to help you decide whether Nature Valley is the brand for you. There are five types of granola bars manufactured by Nature Valley: Crunchy, Chewy Trail Mix, Chewy with Yogurt Coating, Sweet and Salty Nut and Roasted Nut Crunch. Within each of these categories are different options that feature several combinations of fruits, nuts and flavors. According to nutrition data on the labels, Nature Valley granola bars range from 90 to 190 calories per bar, making them a suitable choice for a midday snack or a healthy addition to breakfast. Crunchy Granola bars have the fewest calories, while Roasted Nut Crunch bars have the most. Sometimes granola bars have lots of added sugars, so it's important to look at the amount of carbohydrates listed on the Nutrition Facts Panel. Nature Valley bars range from 13g to 26g in carbohydrates, with the Chewy Trail Mix, Chewy with Yogurt, and Sweet and Salty bars containing the most. The addition of fruit and yogurt is what makes these bars richer in carbs. Depending on what ingredients are added to the granola bar, fat content can be high. For Nature Valley granola bars, fat content ranges from 3g to 13g per bar, with the Roasted Nut bar containing the most fat, and the Crunchy Granola bar containing the least. However, the high fat content of the Roasted Nut bar is actually due to monounsaturated fats (a healthy fat) from nuts. In general, these granola bars are low in saturated and trans fats (the bad fats). Nature Valley bars provide a negligible amount of protein, and therefore should not be used as a primary source of this nutrient. However, the bars do contain dietary fiber and so can be used to up your fiber intake. Additionally, the bars have no cholesterol and are low in sodium (a unique feature among packaged snacks)! Very few ingredients are actually needed to make a granola bar, and thankfully, most Nature Valley bars have a short ingredient list. Their basic bar, the Oats 'n Honey, contains: whole grain oats, sugar, canola oil, yellow corn flour, honey, soy flour, brown sugar syrup, salt, soy lecithin, baking soda and natural flavor. 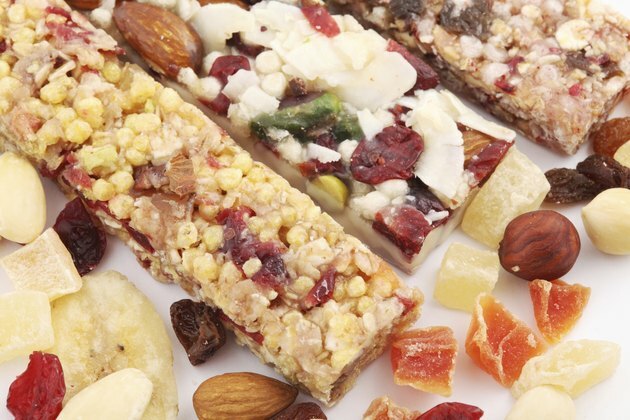 A more complex bar, the Fruit and Nut Chewy bar, has a similar ingredient list, with the addition of raisins, almonds, roasted peanuts, cranberries and sunflower seeds. There are additives (from natural sources) that are used to retain freshness in Nature Valley's bars. How Many Calories Are in Rice Krispie Treats?